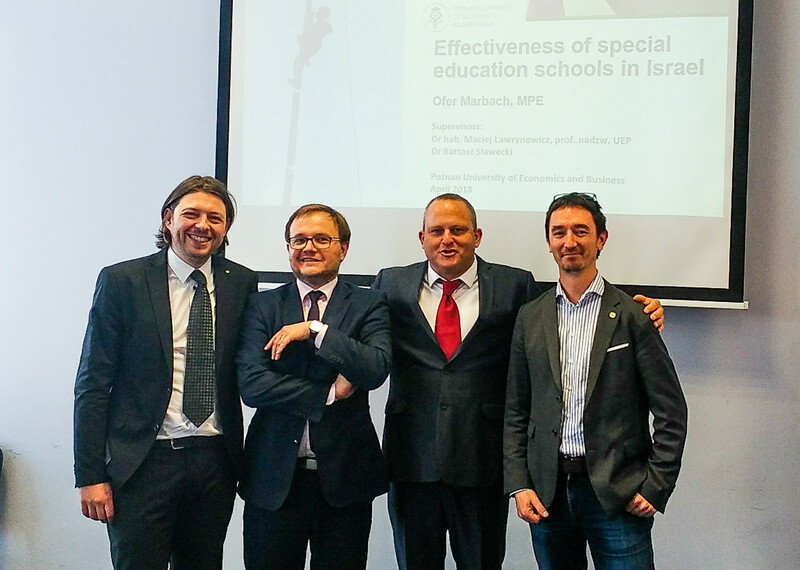 The supervisor of the dissertation entitled “Effectiveness of special education schools in Israel” was associate professor Maciej Ławrynowicz and the auxiliary supervisor was dr Bartosz Sławecki, both from Poznan University of Economics and Business. The reviewers of the dissertation were: professor Józef Orczyk and associate professor Beata Jamka. Itai Blitzer is next DSE graduate to pass the procedure of additional recognition of the PhD title in Israel. The test is only meant for recognizing it for working in government related institutions for a position with PhD salary levels. The Ministry of Education doesn't force anyone to pass any exam, degrees from PUEB are automatically recognized. This procedure repeats the viva in Israel, with the reviews of thesis and answering the questions. The supervisor of the dissertation entitled “Technology Acceptance Factors Determining Online Banking in a Developing Economy. The Case of Jordan” was associate professor Michał Jurek from Poznan University of Economics and Business. The reviewers of the dissertation were: associate professor Jan Koleśnik from SGH Warsaw School of Economics (Poland) and associate professor Michał Polasik from Nicolaus Copernicus University in Toruń. The supervisor of the dissertation entitled “Acquired firm`s contribution to M&A success: Research evidence from the Israeli hi-tech experience” was associate professor Jan Polowczyk, and the auxiliary supervisor was dr Piotr Trąpczyński. 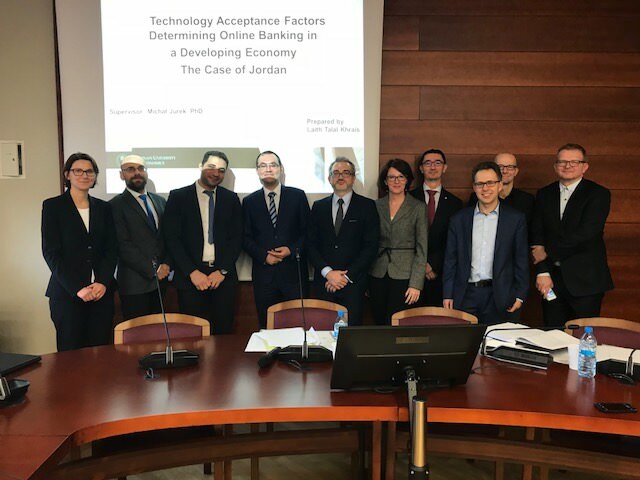 The reviewers of the dissertation were: associate professor Joanna Cygler from SGH Warsaw School of Economics (Poland) and associate professor Gary L. Evans from University of Prince Edward Island (Canada). We are pleased to announce that the deadline of abstract submission has been extended up to May 14 in response to numerous requests and due to the increased interest in The Third International Conference for PhD Students and Young Researchers in Economics, Management and Finance. The conference committee will inform successful applicants by the end of 21 May 2017. In academic year 2016/2017 following additional lectures (not included during DSE meetings) are available: International Marketing - prof. Elena HorskaQuality Management in a Logistics Network - prof. Anna ŁupickaManagerial Economics - prof. Stefan BojnecQuantitative Methods in Finance - prof. Taufiq ChoudhryTax Systems - prof. Hans-Georg PetersenFor more information please send us an email.